And here to help minister to your winter reading needs, our dedicated independent booksellers weigh in with some of their picks for the darkest of seasons. Put the kettle on and settle in. Charles Demers is well on his way to being the King of Comedy in Canadian writing. His razor-sharp, self-deprecating, intelligent humour is such a pleasure to read; I've loved each of his books and this one is no exception. Charlie has the amazing ability to make you burst into laughter while reading an account of him coming to terms with OCD, or having a poignant moment with his brother on the anniversary of their mother's death. This is the dark, funny, perceptive, and poignant book you didn't know you needed. Susan Musgrave’s A Taste of Haida Gwaii offers readers a fascinating look at life on the edge of BC. 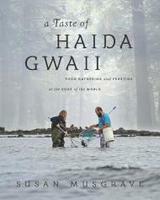 Packed with mouth-watering recipes, wonderful photos, and interesting stories, this is a book that is equally at home in the kitchen or in the armchair of anyone interested in the people and food that make Haida Gwaii such a unique jewel in our province. With incredible candour and his wry sense of humour, Ian Brown takes us on a journey (for some of us kicking and screaming!) into the land of being sixty years old. What a trip. Worth every moment. And NOT just for those nearing, or in, that decidedly advanced decade!! I can’t stop thinking about, or talking about, When the Saints, by Sarah Mian. This book is darkly funny, moving, and just plain fantastic. It is a debut novel that startles with its clarity of voice. The Place of Shining Light, by Nanzeen Sheikh, is a sharply observed, propulsive novel set in contemporary Afghanistan and Pakistan. Three principal characters involved in the smuggling and purchase of a 5,000-year-old Buddhist statue—and the illegalities around it—drive the book. This is a literary work with gas in the tank, and a stunner of a tale, replete with hints of war, greed, faith, and regret. Think The Kite Runner, except written with a good deal more subtlety.